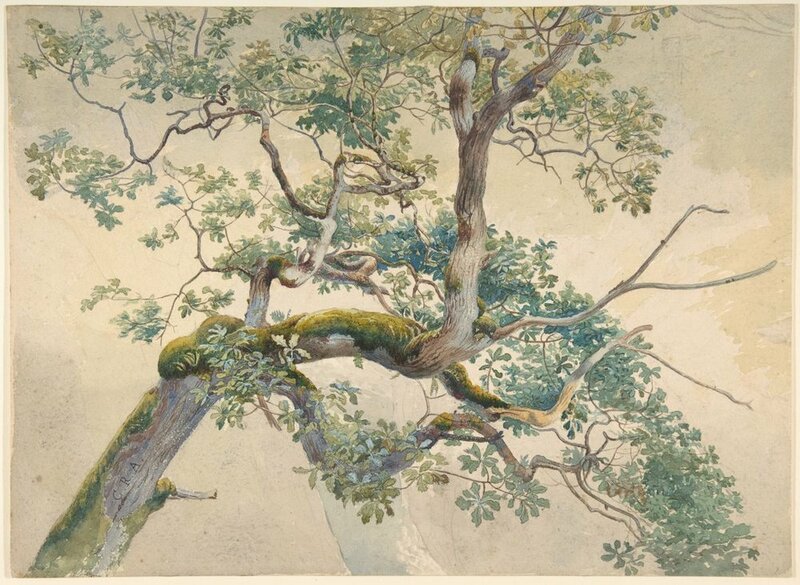 Tree Branches, Charles Reginald Aston, (British, Birmingham 1832–1908). Watercolor over graphite; sheet, 9 1/2” x 13”, drawings. Photo courtesy of the Metropolitan Museum of Art. We arrived in Jacó in a sweltering cocoon of exhaustion, the humidity a mild 83%, considering we’d flown from Houston, and nobody was complaining. The beaches were ribbons of barren white and cerulean sweeping across the Pacific coast in every view. Canopies of green and towering ceibas framed the winding dirt roads that led us in and out of civilization. Coconuts littered the ground, where civilians walked past lines of vehicles with plastic bundles of plantains, coconuts, and tamales. I could feel the heat of the day pressing deeper into our tiny van, but with Jacó nearly in sight, discomfort seemed of little significance. It was a trip designed to pull me outside of myself, for my best friend C. as well, who was my constant companion on any adventure large or small. We were juniors in college, self-involved but seeking, willfully ignorant yet wanting to learn more about the world outside our Southern orbit. C. had never been outside the country, having secured her first passport two days before our departure. The location was ideal. She loved the thought of tropical beaches, jungles and unpaved roads. I loved the prospect of reading in the shade, having no one to answer to. With sleep suspended in the air about our heads, we jostled and jumped with each hitch in the dusty highway as if one with the vehicle, our physical presence commanded by the tilt of the steering wheel. I pushed my sun hat further atop my forehead and rested my cheek against my C.’s shoulder. Retrieving her Go-Pro from her carryon, she held the tiny lens to the window, and we both watched the forest roll past us in fishbowl form. I studied the Spanish-European influences in the architecture of the dusty villages we sped past, the wide, open marketplaces with walls of ripe, hanging fruit. Jacó is an eye-watering, energetic beach town located within two hours of Costa Rica’s capital and is known among the tourist crowd for its younger, carefree nightlife atmosphere. C slumbered against my shoulder, the sun sifting through the car windows. Costa Rica’s history was not lost on us; I studied a crinkled Frommer’s manual detailing how Christopher Columbus made landfall in the paradise in 1502. Soon after, his forces overwhelmed the indigenous people. He incorporated the territory into the Captaincy General of Guatemala as a province of New Spain in 1524. For the next 300 years, Costa Rica was a colony of Spain, one sparsely developed and impoverished. In our silent understanding, we knew each other felt a sense of guilt for being the kind of person to frolic, photo-ready, among a civilization far less provided for than our shiny, metallic metropolis with its man-made parks and fountains. Grieved at such self-awareness, I looked for signs of wildlife in every window through the trees of the forest, mesmerized by the scarlet macaws of Carara National Park, the Tárcoles River, and the Bijagual Waterfall. Many historians say that after Columbus’ intrusion on the island, the area no longer had enough of an indigenous population to force into labor, which meant most of the settlers had to work their own land, while the people who were first beckoned by every wave, wind, and cast of the high sun were, as is the history of far many other destinations, driven to near-extinction. Their ancestors now comprise 2.4 percent of the total population. I wondered how many blistered hands it took to create a tourist’s paradise for obnoxious sun-hatted travelers like me. C. pointed awe-stricken at the plethora of bright, grumpy iguanas. A stop off in Garabito led to a tremulous walk along the highway overlooking a swarm of alligators in the river below. They neared the shore in droves, as if searching for a spot of shade. Some appeared to be sleeping, their scale-y forms half in, half out of the dark water. I held on to my hat with a firm pinch as the wind became increasingly persistent. But it wouldn’t be until after we reached our humble collection of stucco rooms in true bungalow fashion that we would happen upon two tanned gentlemen in demand of foreign company, one with a persistent adoration of my headwear. We could tell they were frequent visitors of the beach. It was our first few steps onto the rocky sand that encouraged us to catapult into the sea, swimsuits slipping, hotel keys flung into the dunes. Having just indulged in two steaming cups of our bungalow’s coffee, we were filled with energy. Thanks to the rich volcanic soil, Costa Rica is well-known for its gourmet coffee beans with the famous Tarrazú considered among the finest beans in the world. Along with bananas, coffee is prime export. It was our kind of place. C. shrieked with delight, doubled over in the grey-blue surface of the water at the image my figure cut: a sopping, half-naked, sputtering fool battling waves atop the ocean floor. I’m a good swimmer, but often too lazy to do anything but float. The orange skies setting overhead were a blinding canvas on which to drown in shallow water as C. pulled me from my peril. “You have to jump into them—dive into the waves with me,” she said, clutching my hand and angling us both towards an oncoming tower of ocean. I watched, transfixed, as an eight-inch wooden staff floated past us towards the shore, its surface marked with age. I tried to grab it but its slippery casing evaded my fingertips. “It looks like a spear,” I murmured over the crash of the current. C. didn’t hear me. After our later explorations across the island, I read the oldest evidence of human occupation in Costa Rica is associated by scholars with the arrival of hunter-gatherers, groups of them, about 10,000 to 7,000 years BC. In the Turrialba Valley, which was just one hour and thirty minutes from our hotel and located in the east side of Cartago Province, is ancient archaeological evidence of stone tool making, clovis spearheads and South American inspired arrows. The original people were nomadic, organized in family-based bands of about 20 to 30. Their typical prey animals were called megafauna: giant armadillos, sloths, and mastodons, among others, which went extinct about 8,000 years before the modern era. The first settlers had to adapt to hunting smaller animals and develop appropriate strategies to adjust to the new conditions. Following a breakfast of salted potatoes, bacon, and eggs, we packed a backpack full of sunscreen, water, both our current reads, two of C.’s bandanas, and two baseball caps, and trekked off on an ATV excursion. We slid onto our respective rides under the direction of our guide, Jaime, and plummeted onto the highways winding round the outskirts of Jacó. With C. ahead of me, gliding across the smooth expanse of barren concrete road, frightfully cautious of every car that swerved in our vicinity, we trailed Jaime for 30 minutes around the perimeter of the coast until we turned onto a secluded dirt path. Hills of winding green pastures and varying clusters of coffee shade and centennial trees arose upon our venture into the depths of broadening jungle. We sped past stray goats, chickens, and wild mares before halting at a rest stop at the peak of the mountain we’d gradually ascended all afternoon. C. turned around to greet me after the past hour of silence and crumpled with laughter. “Your face!” was all she could say in search of breath. I felt the sudden weight of grime on my skin. From the brim of my cap to the tip of my chin, it was completely brown in color, covered with the dust of the journey. I giggled, rubbing off as much of it as I could with a bandana before mounting the ATV once more in search of a nearby waterfall. The jungle’s overgrowth, seemingly to the reaches of the sky, was nothing short of masterful; it appeared to escape time, even the harshest wounds of Costa Rica’s history. I scoured the internet on our evenings in the bungalow to learn that in the early 19th century, Napoleon's occupation of Spain led to the outbreak of revolts all across Spanish America. In New Spain, once the Viceroy was defeated in the capital city—today Mexico City—in 1821, the news of independence was sent to all the territories of New Spain, including the Intendancies of the former Captaincy General of Guatemala. Costa Rica joined the other Central American Intendancies in a joint declaration of independence from Spain. There were no clouds in sight, nothing at all indicative of the contentious history of the island, as we trekked through an opening in the canopy trees, ATVs parked along a swiftly flowing stream where local woodcarvers had set up shop for tourists in search of souvenirs. C. marveled at a multi-drawer box in the form of an alligator, which she bought with a gleeful smile in my direction. Monkeys yammered in the branches above our heads as we moved quietly through the forest into a small clearing. The water roared down from a fatal cliff in foamy spray, landing in a shallow pool of amber-hued water, due to the rocky floor. C. discarded her backpack and cap onto a collection of boulders near the water’s edge, and I quickly followed suit.